Nicholas "Nick" Carraway is a Yale graduate and World War I veteran from the Midwest who takes a job in New York as a bond salesman. He rents a small house on Long Island, in the village of West Egg, next door to the mansion of Jay Gatsby, a mysterious millionaire who holds lavish parties. Across the bay, Nick's second cousin Daisy lives with Tom Buchanan, her husband who attended Yale at the same time as Nick. Daisy and Tom ask Nick to dinner at their home, where they introduce him to Jordan Baker, a well-known golfer. The atmosphere of the dinner is spoiled when Tom answers a telephone call that Jordan suggests is from his mistress, Myrtle Wilson. Myrtle is the wife of George Wilson, who owns an auto repair shop in the "Valley of Ashes" on the outskirts of New York City. One day, Tom takes Nick privately to a flat in Manhattan where they meet up with Myrtle and have a small party but it ends up with Tom breaking Myrtle's nose following an argument regarding whether Myrtle should be allowed to speak Daisy's name. 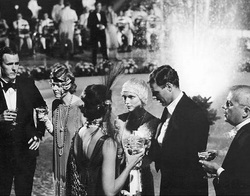 Nick eventually gets an invitation to one of Gatsby's extravagant parties next door, where he soon spots Jordan. Almost all of the guests seem to be uninvited and do not know their host, who keeps himself detached. Nick, however, is coincidentally recognized by Gatsby from their having served in the same division in the war and the two instantly take a liking to each other. For the remainder of the novel, Nick revels in the puzzle of Gatsby's larger-than-life persona, soon accentuated by a lunch in Manhattan shared among Gatsby, Nick, and Meyer Wolfshiem, a close business associate of Gatsby's. Later, Jordan reveals to Nick that in 1917, Gatsby, coming from a poor Midwestern family, had courted Daisy and hoped to marry her, but was sent to Europe to fight during the war, briefly studying at Trinity College, Oxford, during which time Daisy married Tom. Gatsby's goals are now made clear: he has reinvented himself, become rich through self-made efforts, bought a house near Daisy, and thrown his enormous parties in the hope that she would, by chance, find her way there one night so that the two can revive their romance. Jordan asks Nick on Gatsby's behalf to arrange a reunion between Gatsby and Daisy. Nick agrees to have both Gatsby and Daisy to tea. Although this reunion is initially awkward, Daisy and Gatsby soon fall in love again. Daisy soon asks Gatsby, Jordan, and Nick to a lunch date at her house, even though Tom is present. At the lunch, Daisy suggests that they all go into Manhattan, and Tom, who is clearly suspicious of Gatsby, drives Gatsby's yellow car with Jordan and Nick, while Daisy and Gatsby follow them in Tom's car. At George's garage, Tom stops to fill the car and an sad Wilson reveals that he knows Myrtle has been having a secret affair. Although Wilson does not know who the affair is with, he has temporarily locked Myrtle in their home above the garage. Gatsby, Daisy, Tom, Jordan, and Nick go to the Plaza Hotel, where Tom angrily confronts Gatsby about his relationship with Daisy and his alleged criminal activities. Gatsby and Tom argue in front of the whole group, Gatsby telling Daisy to come with him, her first love, and to deny that she ever loved Tom. She avoids both men's appeals and begs to go home. By the end of the argument, Tom scornfully orders Daisy and Gatsby to shamefully go home in the same car. The two leave, taking Gatsby's yellow car. Nick suddenly remembers that it is his birthday and he is now thirty years old. He, Tom, and Jordan then ride off in Tom's blue coupe. Meanwhile, as Daisy and Gatsby race past George's garage, Myrtle recognizes the yellow car and runs into the road, where the car, which is being driven by Daisy, strikes and kills her. The pair continue to drive without stopping. Tom soon arrives with the other two and discovers Myrtle's corpse. Back home, Tom and Daisy have a reconciliation,and they pack up and hastily leave town. Gatsby later tells Nick that it was Daisy driving the car, but he will take the blame. Nick tells Gatsby to leave town, but Gatsby refuses. He finally tells Nick about his life and how he - born James Gatz - came to have the name Jay Gatsby. The next day, Tom tells George that Gatsby was the driver on the night of the accident, which made George believe it was Gatsby with whom Myrtle was having an affair. George tracks down Gatsby's address and arrives at the mansion to find Gatsby relaxing in his pool; George shoots Gatsby dead and then commits suicide. Upset by Gatsby's sudden death, Nick arranges Gatsby's funeral, which is attended only by Nick, Gatsby's elderly father, and man who used to show up at Gatsby's parties. Nick is disgusted by the small turnout at the funeral, given his repeated attempts to get in touch with any of Gatsby's previous party guests or associates, none of who go to the funeral. Nick runs into Tom on the street and later meets up with Jordan, openly revealing his discontentment with them both. Nick decides to give up his job and his house. He resolves to return to the Midwest. Nick Carraway — the novel’s narrator; he is a young man from Minnesota who went to Yale, fought in World War 1, and he eventually goes to New York City to learn the bond business. Nick is honest and tolerant and often serves as a confidant for those with secrets. After moving to the West Egg, Nick meets and befriends his next-door neighbor, the mysterious Jay Gatsby. As Daisy Buchanan’s cousin, he helps revive the romance between her and Gatsby. Jay Gatsby (James Gatz) — The main character and protagonist of the novel, Gatsby is a wealthy young man living in a mansion in West Egg. He is famous for the lavish parties he throws every Saturday night, but no one knows where he comes from, what he does, or how he made his fortune. As the novel goes on, Nick finds out that Gatsby was born James Gatz on a farm in North Dakota. He worked for a millionaire and was inspired to become one himself. When he met Daisy while training to be an officer, he fell in love with her. Nick views Gatsby as a dishonest man, whose great optimism to transform his dreams into reality make him “great” nonetheless. Daisy Buchanan — Nick’s cousin and the woman Gatsby loves. As a young woman in Louisville before the war, Daisy was pursued by a lot of officers, including Gatsby. She fell in love with Gatsby and promised to wait for him. However, she ended up marrying tom Buchanan while Gatsby was away. Daisy lives with Tom across from Gatsby in the East Egg district of Long Island. She is sarcastic and behaves superficially to cover up her pain at her husband’s infidelity. Tom Buchanan — Daisy’s wealthy and arrogant husband, once a member of Nick’s social club at Yale. He is a racist and a sexist. He has no second thoughts about his own extramarital affair with Myrtle, but when he begins to suspect that Daisy and Gatsby are having an affair, he becomes mad and forces a confrontation. Jordan Baker — Daisy’s friend; a woman with whom Nick casually dates during the course of the novel. Jordan is a competitive golfer and is self-centered and cynical. George B. Wilson — Myrtle’s husband,exhausted owner of a run-down auto repair shop at the edge of the "Valley of Ashes". George loves Myrtle, and is devastated by her affair with Tom. George is consumed with grief when Myrtle is killed. Myrtle Wilson — The woman who Tom is having an affair with, whose exhausted husband George owns a auto repair shop in the "Valley of Ashes". Tom treats her as a mere object of his desire. The 1920s were an age of dramatic social and political change. For the first time, more Americans lived in cities than on farms. The nation’s total wealth more than doubled between 1920 and 1929, and this economic growth swept many Americans into an affluent but unfamiliar consumer society. People all over bought the same goods , listened to the same music, and did the same dances. Many Americans were uncomfortable with this new, urban, sometimes racy culture. However, For a handful of young people in the nation’s big cities, the 1920s were roaring indeed. The cover of The Great Gatsby shows ghostly eyes and a mouth over a blue skyline. An artist named Francis Cugat illustrated the book cover while Fitzgerald was in the midst of writing it. The cover was completed before the novel; Fitzgerald was so infatuated with it that he told his publisher he had written it into the novel. Fitzgerald's remarks about incorporating the painting into the novel led to the interpretation that the eyes are reminiscent of those of Dr. T. J. Eckleburg which Fitzgerald described as "blue and gigantic — their retinas are one yard high. They look out of no face, but instead, from a pair of enormous yellow spectacles which pass over a non-existent nose." Although this passage has some resemblance to the painting, a closer explanation can be found in the description of Daisy Buchanan as the "girl whose disembodied face floated along the dark cornices and blinding signs." I was very surprised by this movie. Usually directors screw the movie up by leaving out details, even the most little of details, which bothers me. However this movie was very similar to the novel. Many of the lines in the movie came from the novel, and there were only two small part that I found they left out in the movie. I am going to go ahead and point out that yes, the movie over exaggerates the 1920's and they didn't have rap/hip hop/pop music back then , but that is just the director's style. I think he did a very good job with converting the book into a movie. But I should still point out that I do still like the book better. The green light - Even if you had never read the book and just seen this movie, you would be able to tell that the green light plays a major part in the story line and that it symbolizes something. The green light in the movie played a large part and the viewer got the sense that the green light showed hope and Gatsby's dreams for the future, which is exactly what the book portrays. The characters - Leonardo, Carey, Tobey, ect. all did an great job playing their characters. They pretty much got the feel of the relationships, and played their characters almost perfectly. Narration - The Great Gatsby the movie added in a twist to the narration. In the movie, Nick started of telling this story in rehab for alcoholism. Then, his psychiatrist recommends that he rights down the story. At the end of the movie, Nick turns everything he had written down into a book called The Great Gatsby by Nick Carraway. I am still not really sure if I liked that part or not. Mr. Gatz (Jay Gatsby's dad) - This is a very small part that they left out, but near the end of the novel, when Gatsby dies, his father comes to Gatsby's house. Mr. Gatz is in awe at the lifestyle his son held and is one of the few who attends Gatsby's funeral. Conclusion between Jordan and Nick - Another small part left out in the movie, was an event that took place near the end of the novel. Basically, Nick sees Jordan again and finds out that she is engaged. She tells him that when she first met him, that she thought he was a nice guy, but ended up being a jerk. To put it nicely, things did not end well between the two of them and in the end, they go their separate paths. These two novels share a similar element: the American dream being crushed. In The Great Gatsby, Gatsby had a dream of being wealthy and getting married to none other than Daisy Buchanan. However that dream comes gets delayed when he finds out that she is already married and he spends almost his whole entire adulthood trying to achieve that dream. He throws lavish parties hoping that Daisy would stop by one day and they would fall back in love. They do find their way back to each other and fall in love again, but when Daisy accidentally hits Myrtle with a car, she goes back to Tom and they take off together. It is Gatsby trying to achieve this dream that gets him killed in the end. George and Lennie also had an American dream. Their's was of owning their own farm where Lennie would be able to take care of rabbits. They got very close to their dream to. They save up money, made new friends that offered to pitch in some money if they could live/work there, and George even started to go look at places. It was Lennie's love for soft things that crushed that dream. When Lennie accidentally killed Curley's wife, George knew that he had to get ahold of Lennie before Curly did. Before George shot Lennie, he told Lennie once again of their farm so Lennie would die happily. It also shows that George realizes that now the dream was never going to come true.